I was deemed hopelessly unathletic by a jury of elementary schoolers when I was six years old — before I ever had a chance to learn how to kick or dribble or catch — because I was the tiniest girl in my class. I'll never forget how it felt to be picked last by my peers during P.E., day after day, year after year, the heat rising off the asphalt and my cheeks as I waited in line until I was inevitably left standing alone, again, staring wistfully at my classroom and wishing I was inside reading a book. There are no statistics on how many P.E. teachers allow kids to pick their own teams, but you'd be hard-pressed to find a non-jock who doesn't recall anxiously hoping he or she wouldn't the last person standing. Emily Bazelon describes the dread of finding oneself partnerless in gym class on the very first page of her new book Sticks and Stones: Defeating the Culture of Bullying. Lee Radziwill — yes, Jackie O's sister — recently told the New York Times that she'd never forget how she "was always the last to be chosen for a team, which was so embarrassing, and made me feel pathetic." Comedian Alan Carr has likened the experience to ethnic cleansing. Less notable folk often discuss the perils of picking teams on parenting blogs; "I'm trying to pin down what was so particularly horrible about it, besides the obvious - and I think I've got it," one mother wrote on BabyCenter. "It's the fact that everyone is witness to your shame." 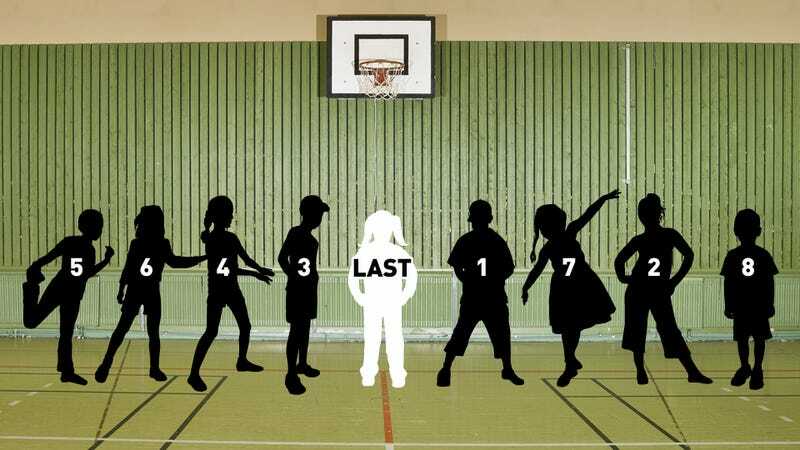 Is there a point to all this systemic misery, or will the practice of letting kids pick their own teams fade away as more educational experts champion ways to focus on character-building in schools instead of just academic achievement? (Check out This American Life's "Back to School" episode for more on that theory). Perhaps it depends on what you think the goal of physical education should be in the first place; the National Association for Sports and Physical Education believes it is "to develop physically educated individuals who have the knowledge, skills and confidence to enjoy a lifetime of healthful physical activity." Does allowing kids to perform their own form of natural selection fit that bill? Rick Wolff, author of multiple books and articles on sports parenting (including Good Sports: A Concerned Parent's Guide to Little League and Other Competitive Youth Sports) and co-founder of the Center for Sports Parenting, thinks so. Choosing sides "forces kids to think through delicate situations in choosing up sides," Wolff told me, noting that adults were never expected to delegate when it came to picking teams until the late '90s. He's concerned that today's elementary schoolers miss out on leadership training as a result. "If the two teams end up in a lopsided game, it's incumbent on the two captains to stop the game, and then re-shuffle the teams so that the talent is spread more equally on the teams...Kids have an amazing knack of keeping sports safe and level" he explained. "This is the beginning of real leadership, and kids learn this on their own." But other experts told me that creating a competitive atmosphere in order to motivate students isn't the best solution, including Sami Klebanoff, a doctoral student in education at UCLA who referenced decades of motivation research that suggests over-relying on tangible rewards and competition actually makes kids less engaged. "Even though this is contrary to popular beliefs, the research seems to suggest that fostering a supportive and cooperative environment would be much more effective," Klebanoff said. Sandra Graham, a professor of Psychological Studies in Education and Chair of the Department of Education at UCLA, said she understood the urge to allow kids to "feel autonomy and have choice," especially in that precious unstructured time outside of the classroom, and acknowledged that that's often how kids learn the value of resilience. But she said that letting kids pick their own teams isn't the best solution since kids, when given the opportunity, will always "hang out with kids who are similar" to them, thus reinforcing hurtful social norms. That's a lesson Robbie Rosen, a 26-year-old former Teach for America fellow, learned the hard way. He said he initially let his Dallas, Texas-area 7th graders pick their own groups in class (not in P.E.) because he noticed that students wouldn't participate as often if they were forced into teams that made them uncomfortable, but that he stopped that practice halfway through his second year of teaching when a student whom he asked to help him pass back papers told him she didn't know who had written five of the assignments. "This class was on the smaller size (24 students) and had the longest meeting time (80 minutes)," he recalled in an email. "In that moment I stopped my independent reading block and asked my students how many of them believed they could name all 24 students in the class. Only about half of them raised their hand." Repeated rejection that fosters "in-groups" and "out-groups" — a "clear sign you deviate from the norm," as Graham put it — also has more troubling longterm reprecussions, according to multiple studies that link peer rejection and later personal adjustment. "Obviously being picked last in P.E. in and of itself isn't likely to cause a kid to become a mass-murderer, but I think the fact that teachers aren't always paying attention to the kind of atmosphere they're creating and the effects it can have is problematic," Klebanoff said. Perhaps gym teachers and their ilk aren't always "paying attention to the kind of atmosphere they're creating" because they're not typically as versed in education theory as teaching fellows and academics — or they just don't want all that responsibility. Billy, a 25-year-old after-school instructor from Philadelphia, told me he doesn't always have the time or energy to fight with middle-schoolers who complain if they can't pick their own teams for games. "My job is hard and rewarding kids by letting them do something they want to do makes my life easier," he said, adding that he feels letting kids pick teams isn't the core issue. "The real question is a societal one," he said. "As long as we're not fully inclusive, the exclusion will surface from time to time." But the potential repercussions for kids who don't want to be judged by their classmates, even if they're in the minority, seem too dangerous to ignore when you consider how many other ways there are to let kids experience self-determination without turning P.E. into Lord of the Flies. Graham suggested letting kids pick their team positions, for example. A New York Times article today suggests budget cuts may pave the swiftest road towards P.E. reform; physical education teachers are are incorporating vocabulary and math into gym class as school officials are forced to choose between subjects. "It's just a way to make P.E. teachers more of an asset to schools and seem as important," said Eric Stern, the administrator in charge of physical education for the Palm Beach County schools, the country's 11th-largest school district. "We are taking away the typical stereotype of what P.E. used to be like." The article also noted that "generations of bookish but clumsy children who feared being the last pick for the dodge ball team may welcome the injection of math and reading into gym class." Yes, they very well just might.